The unopened product is stable at -20°C for 2 years. After use, the resin should be cleaned and stored in 50% glycerol with 10mM sodium phosphate, 150 mM sodium chloride, pH 7.4, containing 0.02% sodium azide to protect the product. Do not freeze in the absence of glycerol. 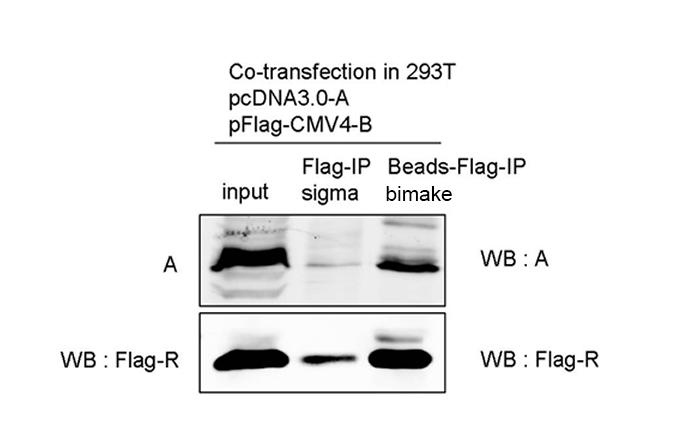 This sample protocol is recommended for Immunoprecipitation of DYKDDDDK-tagged (FLAG-tagged) Proteins. Bead Preparation 1. 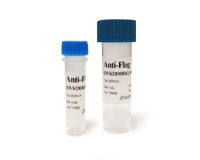 Thoroughly suspend the Anti-Flag Affinity Gel in the vial, for a uniform suspension of the resin. 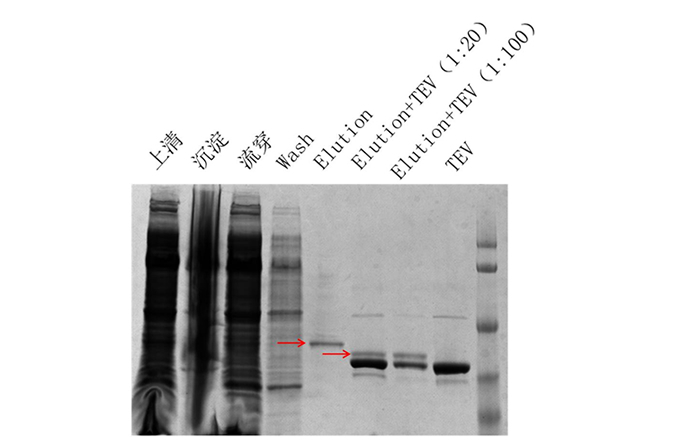 Quickly transfer 10 μl of the gel suspension (about 5μl of packed gel volume) to a fresh tube. 2. Add 0.5 mL TBS. 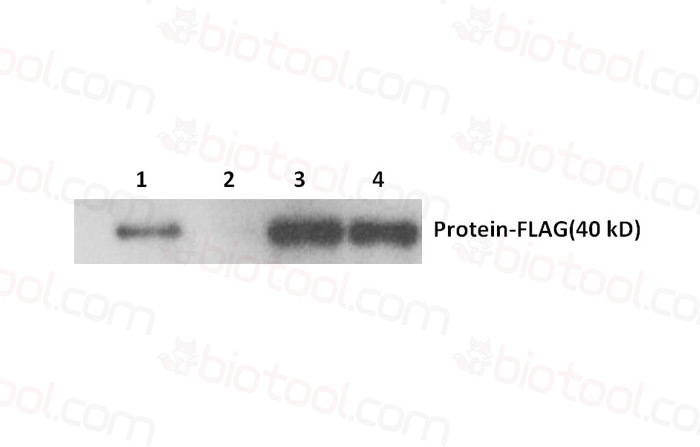 Thoroughly suspend the Anti-Flag Affinity Gel by pipetting. Centrifuge the resin at 5000 rpm for 30 seconds and carefully remove the supernatant. Be sure to remove all of the wash buffer without discarding the resin. Repeat 3-4 times. 3. Add 500 μl of cell periplasmic extracts to the washed resin. 4. Gently agitate samples for 2 hours at 4°C. 5. Centrifuge the resin for 30 seconds at 5000 rpm. 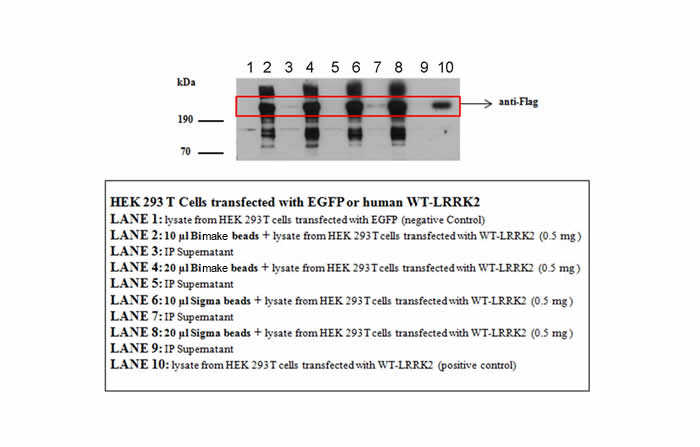 Transfer the supernatants to a fresh tube. 6. Wash the resin with 0.5 ml TBS until the OD280 of the supernatant reads <0.05. 7. 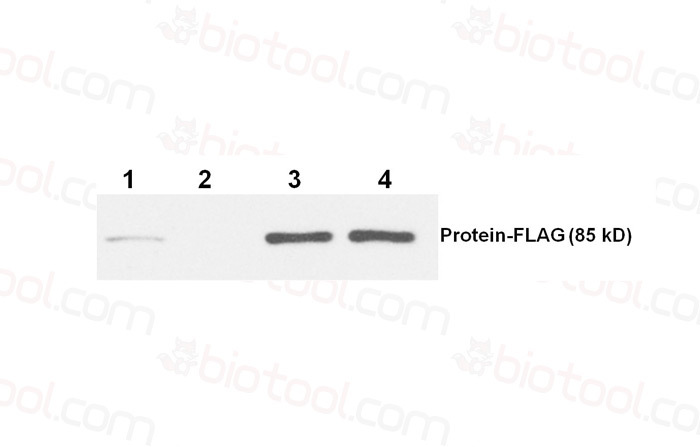 Extreme pH condition or excess poly Flag peptide can be applied to the resin to elute the Flag-tagged protein. 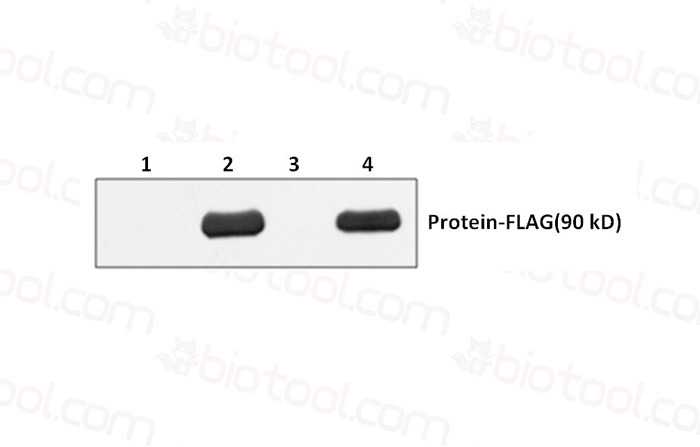 Choose elution methods according to the characteristics of target protein and downstream application. 8. 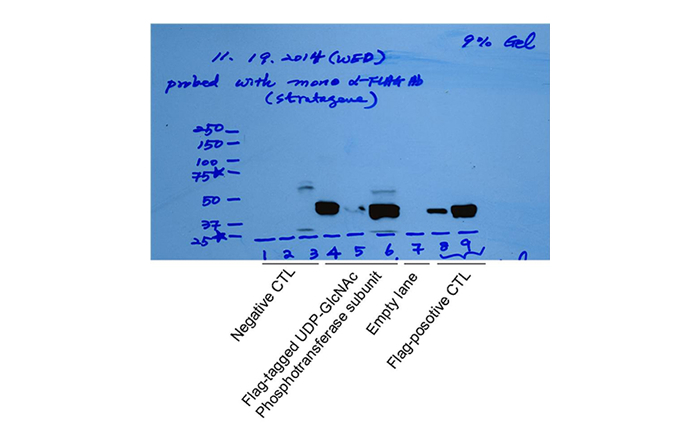 For direct detection of target protein, add 2x SDS-PAGE sample loading buffer at a 1:1 ration to 20 ul gel suspension. Boil the sample for 5 minutes. Centrifuge at 5000 rpm for 30 seconds. 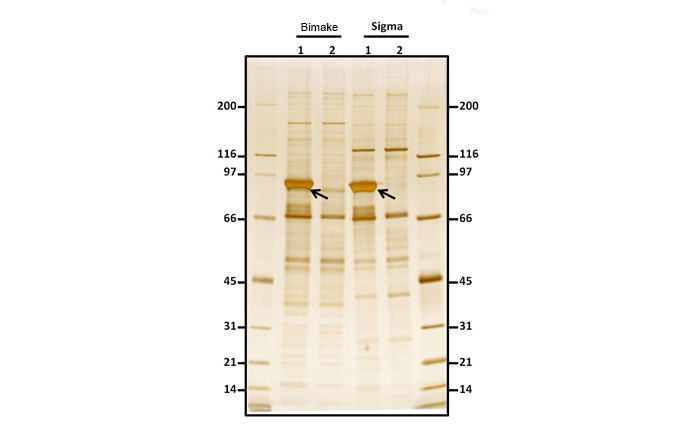 Carefully transfer supernatant into a new vial for SDS-PAGE. 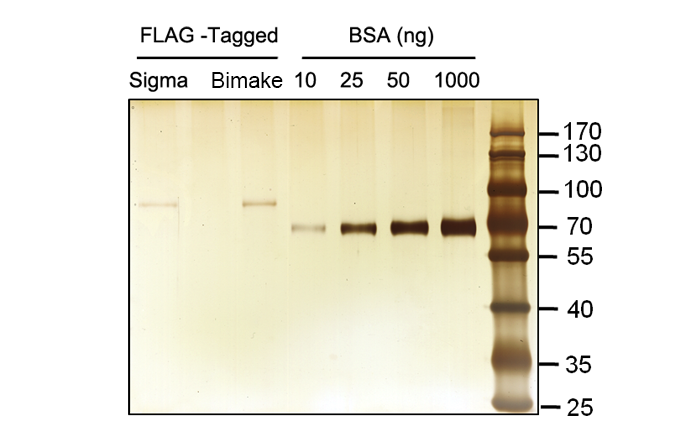 Bimake provides Poly FLAG Peptide lyophilized powder for protein product elution.